The Geelong Cats have elevated one legend, added two past greats as Hall of Famers, named three new life members and awarded the annual RJ Hickey award in a glittering night at GMHBA Stadium. Teddy Rankin, who debuted with Geelong in 1891, was tonight elevated to become the club’s 25th legend. 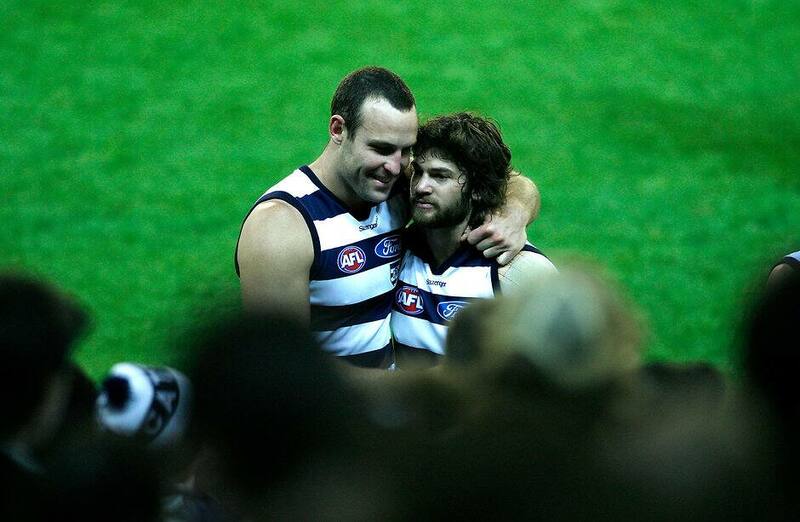 Brad Ottens and Max Rooke, who shared premiership glory with the Cats, are the latest hall of famers. Malcolm Blight, Colin Carter and James Rahilly have earned life membership, and Brian Cook has claimed the RJ Hickey award for services to football in the year he became the equal longest serving CEO in AFL history. Rankin debuted as a 19-year-old against South Melbourne and went on to play 268 games with club. A brilliant player who could play a multitude of roles, Rankin was at his best as a rover.Skilful and fast, Rankin possessed great stamina. A clever player, Rankin was the first to run and touch the ball on the ground on wet days rather than risk bouncing the ball in full flight. A staunch believer in playing for the love of the game rather than money, Rankin rejected offers to move clubs, and continued on with Geelong until retiring in 1910 some 19 years since his debut. During his career with Geelong, Rankin played with 261 players, the most team mates that any Geelong players has run out with in the club’s 159-year history. His career included a best & fairest in 1903, representing Victorian three times and captaining the club in 15 games. The Rankin family had a strong connection to the club, Teddy’s brothers Sam and Tom also played with the Cats, and his sons Bert, Cliff and Doug also went on to wear the navy blue and white hoops. Following his retirement, Rankin served as groundsman at Geelong College for 40 years and also served a football coach at the school. The legend award was accepted by Teddy’s son Geoff. Ottens played 116 games for the Cats after crossing over from Richmond. Ottens booted 109 goals and led the ruck division in three grand final wins in 2007, 2009 and 2011. Perhaps Ottens’ greatest performance came in the 2007 preliminary final. The Cats held on to beat Collingwood by five points with Ottens best on ground. Just a week later, Ottens’ first quarter chase and tackle on Michael Pettigrew set the tone for the day as Geelong broke a 44-year premiership drought with a record setting 119-point win. Rooke was an inspiration to his teammates over his 135-game career. Caring only for his team, Rooke played a variety of roles and displayed the spirit that was evident through that period of Cats history. Rooke’s ability to play so many roles allowed the Cats coaching staff flexibility in how they set up the team. A member of both the 2007 and 2009 premierships, Rooke’s 2009 grand final performance against St Kilda will live long in the memory. He was among the best on ground, garnering votes in the Norm Smith Medal. Rooke booted the first and last goals in the low scoring affair as the Cats prevailed by 12 points in a classic contest. Carter first became a board member of the Geelong Football Club in 1988 and served until 1993 when he retired from the board to take up an appointment on the AFL Commission, a position he held for 15 years. During his time on the Commission he drafted the blueprint for the future of the league, and his handprints are clearly seen on the great AFL competition as it stands today. Upon his retirement from the AFL Commission in 2008, he was reappointed to the board of the Geelong Football Club, and has now held the position of President since 2011. In all, Colin has given almost 17 years’ service to the club. Carter has virtually written the handbook on the relationship between a board and management. His leadership and innovation, his values and his stewardship, have helped to steer the club into the strong position it’s in today. Rahilly was selected by the Cats with the 38th pick in the 1997 AFL national draft. Originally from South Warrnambool, Rahilly was recruited from the Geelong Falcons, and played the first of his 90 senior games with the Cats in 1998. He won the best first year player in his debut campaign and earned a Rising Star nomination the same year. Rahilly was a key member of the 2002 VFL Premiership team, when he was awarded the Norm Goss Medal as best on ground. Always a great teammate, Rahilly was named as best clubman in 2003. Overall he spent nine years at the club as a player, and in 2008 returned to the club as a development and specialist coach. In 2011 he was appointed as an assistant coach where he remains a most valued and respected member of the senior coaching staff and indeed the club. Blight served as senior coach from 1989 until 1994, leading the Cats to three grand final berths in his tenure. He coached Geelong 145 times and ranks fourth on the list of all time Geelong coaches. Blight coached during a time of rapid change, as football transitioned from a part time game to the professional level we see today. Over his six years at the helm the Cats won 61% of their games, emerging victorious in 89 of 145 matches. Of the 145 games, 15 were finals, including reaching the last day in September in 1989, 1992 and 1994. The Geelong team of 1992 established a league record that still stands, registering 37.17 (239) against Brisbane. The Cats won 11 times by over 100 points during Blight’s time as coach. Awarded for services to football, Cook has been recognised in his 29th season as a club CEO, equalling the mark held by Frank Reid (Essendon 1908-36) and Bill Cookson (Essendon 1944-72). Cook has enjoyed highs in all facets of the game. As a brave and speedy player, he spent two years with Hawthorn before transferring to Melbourne. He made his league debut on Queen’s Birthday Monday in 1977, playing a total of four games with the Demons. He also spent time with Box Hill and Caulfield in the VFA and headed to Perth in the late 1970’s to further his study. While in Perth he represented Subiaco and East Perth at senior level. Cook also dabbled in coaching, guiding the East Perth reserves to premiership success. Following his retirement as a player, Cook forged a new path in sports administration. He was appointed a CEO of the West Coast Eagles in 1990, and throughout the decade the Eagles were a powerhouse in Australian sport. Claiming premierships in 1992 and 1994, the Eagles saw sold out crowds and surging membership. Cook moved to the Cats in 1999 and inherited a club in serious financial debt and without a premiership since 1963. In the 20 seasons that have followed the Cats have been a perennial premiership contender and won the flag three times. He has overseen four major stadium redevelopments and grown the club’s commercial outcomes to record levels. Originally from Scotland, Cook has made a mark on two clubs that will never be diminished and has earnt life membership of both the Cats and the AFL.